Jane the Virgin Season 4 Premiere Photos with Tyler Posey! The CW has now released more promotional photos for the Jane the Virgin Season 4 premiere! Jane the Virgin Season 4 premieres Friday, October 13 on the network, and the first picture which was released last week featured Jaime Camil as Rogelio and Andrea Navedo as Xo. But now, we have more photos… including some shots of Teen Wolf alum Tyler Posey as Adam! The episode is called “Chapter Sixty-Five,” and we now have an episode description which you can see above the photos. SURPRISE – When Jane (Gina Rodriguez) is reunited with her first love, Adam (guest star Tyler Posey), she is shocked but happy to see him, however Xo (Andrea Navedo) and Alba (Ivonne Coll) are less thrilled that he is back. After Rafael (Justin Baldoni) loses ownership of the hotel to his sister, he finds himself at Jane’s house, broke and homeless. Jane and Rafael learn that Petra (Yael Grobglas) has been found and they rush to her aide, but Anezka (Yael Grobglas) is nowhere to be found. Meanwhile, Xo and Rogelio (Jaime Camil) wedded bliss is interrupted when they confront the realization that Darci (guest star Justina Machado) is having Rogelio’s baby and she wants full custody. Brad Silberling directed the episode written by Jennie Snyder Urman & Paul Sciarrotta (#401). Original airdate 10/13/2017. 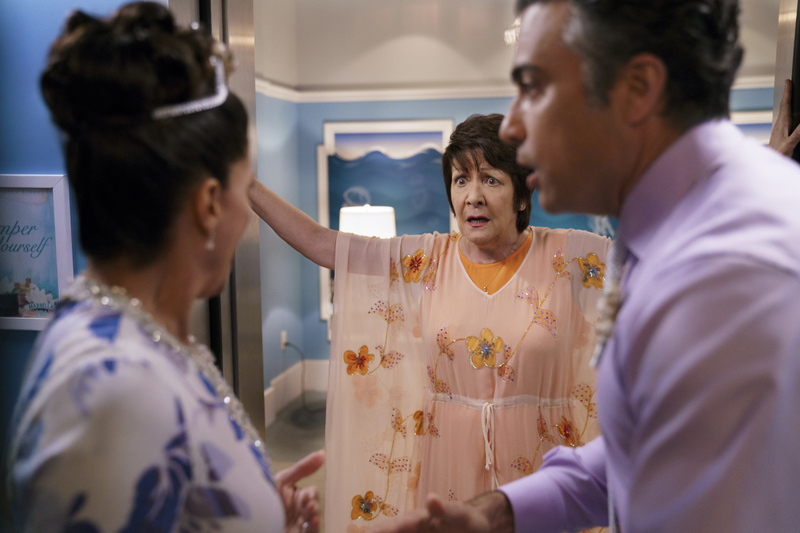 Jane The Virgin -- "Chapter Sixty-Five" -- Image Number: JAV401a_0038.jpg -- Pictured (L-R): Andrea Navedo as Xo, Ivonne Coll as Alba and Jaime Camil as Rogelio -- Photo: Michael Desmond/The CW -- ÃÂ© 2017 The CW Network, LLC. All Rights Reserved.